Future homebuyers in Greater Baton Rouge are invited to learn how to build credit to purchase a new home. 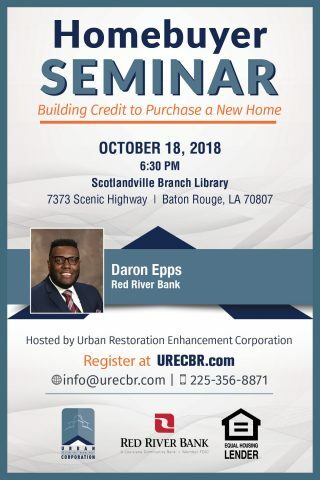 Urban Restoration Enhancement Corporation, in partnership with Red River Bank, will host a Homebuyer Seminar on Thursday, Oct. 18, 2018, 6:30 p.m. to 8:30 p.m., at Scotlandville Branch Library, 7373 Scenic Highway, Baton Rouge, La. 70807. Register here or below. Daron Epps, assistant vice president of community outreach, lending, at Red River Bank will serve as the guest presenter. UREC and Red River Bank are pleased to offer the seminar as a service to the community, and there is no cost to attend. Online pre-registration is required. For more information, send an email to info@urecbr.com, or call (225) 356-8871.